Unique Stylish Purses | Miche Bags: Miche Bags Rachel Prima Shell, Backpack! Miche Bags Rachel Prima Shell, Backpack! Is it a handbag or a backpack? Both! Urban Shells have discreet rear bottom loops that give you the freedom to turn your Prima Bag into a backpack whenever you want to! 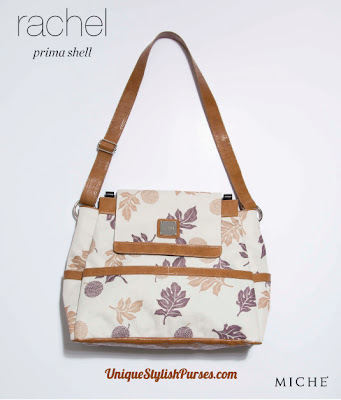 The Rachel Urban Shell is a sturdy printed canvas design featuring tan and aubergine leaves and allium flowers; dark tan faux leather accents and white contrast stitching pull the feeling of nature together. A total of four lined roomy pockets on the front and back as well as side pockets allow for plenty of storage. Comes with two matching tan adjustable straps. Strap Dimensions: Length adjusts from 21–39”; Width: 1.25”. Carabiner is 1.5”.